The late Gwen Frostic, author, poet, and artist, lives on in the business she created over 50 years ago just outside of Benzonia. To visit Gwen Frostic Prints is to take a big step back in time. Walking through the door, you can feel and smell the history all around you. Although Frostic died in 2001, her legacy continues thanks to Kim and Greg Forshee. The property was on the verge of foreclosure in 2010 when the Forshees stepped in and saved it. Gradually they have brought the property and studio back to life. From the beginning, their main goal has been to preserve the art that Frostic spent a lifetime creating. Originally, Frostic produced metal and plastic print blocks, but during World War ll she had to begin using linoleum due to the scarcity of metal. Over the years, she created an astonishing 2,200 metal and linoleum blocks, all of which are still in use today. 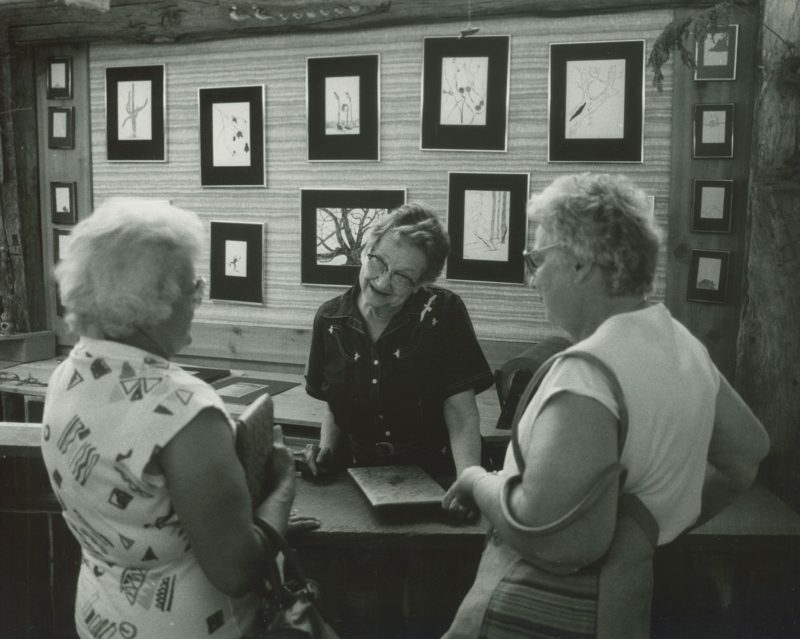 Gwen’s nephew, Bill Frostic, operates the antique presses that have been used to print her nature designs on paper greeting cards, notepads, and postcards for decades. If you are lucky, you will see the presses in operation during your visit. A large viewing window allows visitors a clear view of the press room. The serene and occasionally whimsical images Frostic created were inspired by the plants, trees, and wildlife that flourish in the natural landscape around the home and studio she built in 1964. She had a true love of nature and seemingly couldn’t get enough. The property is speckled with ponds, pathways, and gardens for wandering that seem to draw people into the magic of the area. Many visitors bring their lunch to enjoy in a quiet spot before they wander through the studio. Greeting cards and other paper goods are by far the biggest sellers, but the Forshees have expanded the product line that displays Frostic’s timeless designs. Along with candles, placemats, pillows, coasters, leather goods, mouse pads, and journals now inscribed with Frostic creations, Forshee creates stunning jewelry using the designs as well. I remember over the years, how receiving a Gwen Frostic greeting card felt like a special touch. Each one seemed to carry her essence with it. The cards gave the feeling that someone took the time to select this particular card just for me. Each one a work of art, it felt like it should be framed after reading the sentiment inside. Writing this article has made me realize I need to take a summer road trip and visit the studio I remember visiting as a teenager. Maybe you should, too!